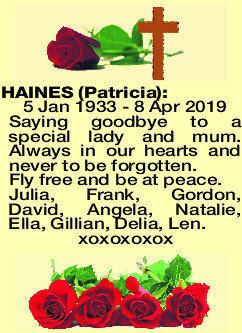 HAINES PATRICIA 5 Jan 1933 - 8 Apr 2019 Saying goodbye to a special lady and mum. Always in our hearts and never to be forgotten. Fly free and be at peace. Julia, Frank, Gordon, David, Angela, Natalie, Ella, Gillian, Delia, Len. 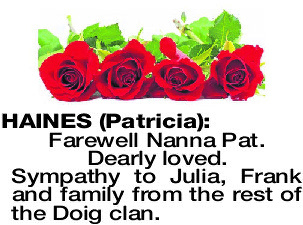 HAINES PATRICIA Farewell Nanna Pat. Dearly loved. 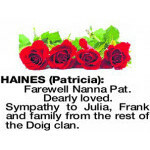 Sympathy to Julia, Frank and family from the rest of the Doig clan.